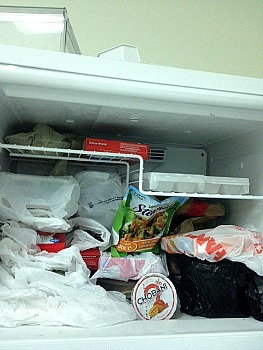 For the last month I’ve been canvassing my work’s freezer in order to steal any frozen meals that might be in there to sustain me during the summer of my unemployment. As far as I was concerned it was a brilliant plan. 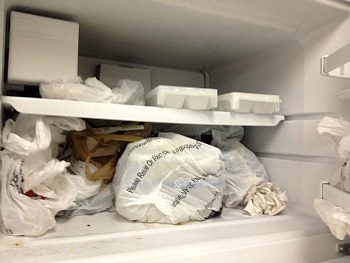 Freezer #2 – second verse, same as the first (only better, this one has yogurt). Look at all of that delicious (sort of delicious…free makes everything delicious, so whatever. It’s edible) food. Right there? 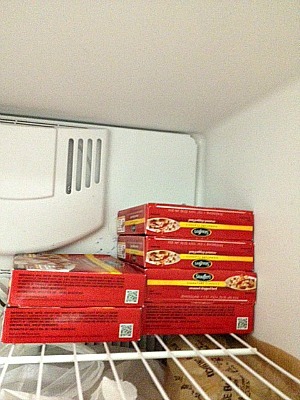 That’s six frozen Stouffer’s Cream Chipped Beef ready meals. Six. Six of them. The day before there was NO food in that freezer. The next day? Six. And of something that traditionally isn’t even a food eaten outside of breakfast. Also, it’s gross looking. And they’ve remained in there for over a week. They all arrived in one day and not a single one has been consumed. So now I can’t be sure that my two office nemeses haven’t heard my plan to steal all of the food (I wasn’t exactly speaking in hushed whispers about my malfeasants) and brought in all of this chipped beef in which to poison me. I’m still going to steal it though.